I’ve realized recently that I have not updated the world on the craziness that is Ella! So, here are some tidbits on our sweet Ella girl! –I must admit that a lot of Ella’s screaming has piped down since I cut out all dairy from my diet (can you say hardest thing ever after being nauseous for 9 months??). Her eczema is gone (I wish we would have taken some pictures at it’s worst, because it was pretty yucky), she doesn’t scream all the way through eating now, she actually wants to eat, and overall just seems much happier. Time will tell if it’s a true allergy, but for now, no dairy has worked wonders for our family! –She HATES tummy time. The fastest way to hear how loud she can scream (once again, I have no clue where she learned volume control…) is to put her on her tummy. It’s like she screams to tell us that she knows we are sending her to her doom. So, she gets most of her tummy time right before bedtimes because we can send her straight to bed where she’ll snuggle up, calm down, and fall asleep, rather than spend 30 minutes during her waketime trying to reassure her that we won’t send her back on her doomful tummy. –She officially turned 5 months this past Friday! She’s almost a half a year! –She is slowly growing out of her 3-6 month clothing and is already in some of her 6-9 month stuff! She’s a long little girl! –She loves her some Mickey and Minnie Mouse! If she’s screaming past the point of any solace, we turn on the TV to Mickey Mouse Clubhouse and she is g-l-u-e-d. As soon as Mickey invites her to his clubhouse, she’s trying to dry up the tears. –Anything she can get her hands on, goes in her mouth. There’s two spots in her mouth where I have thought for sure that a tooth would come bustin’ out soon. But, nothing so far! But, she loves to chew on any of her toys, her hand, my hand, her pacifier, and even her clothes if she can grab a piece of it, haha. –I am falling more in love with her every day. One thing I didn’t realize as being a new parent is that sometimes it takes a little while for the bond to mature, and that’s okay. Don’t get me wrong, I loved her from the beginning, but now that she’s blossoming into her very own self and not just a screaming bump on a log (I mean, seriously, newborns have always been kinda bump on the log-ish to me), I am loving her beyond what I thought I could. Every day that love for her grows a little more. I just wish I could hold her and squeeze her all the time! I didn’t want to put her down for her morning nap today because she was just so yummy (John doesn’t understand that term, but whatever). Under all of that strong-willed personality, she is just the sweetest little baby that loves to giggle, smile, and hold on tight for a good hug. We are so glad the Lord gave us her, even on the tough days!! I think those are enough Ella tidbits for now! I need to do better at keeping up with some of her shenanigan’s on here, so I can remember them! ← 2010 in Review by Pictures! Thanks for the update! She is just precious! Mickey Mouse Clubhouse is Miles' favorite also. If it comes on, he comes running. I adore this post. I can relate on many levels, and you said so many things better than I ever could when describing our darling screamer. Your love for her is apparent and beautiful, and I hope you know what a great job you're doing. 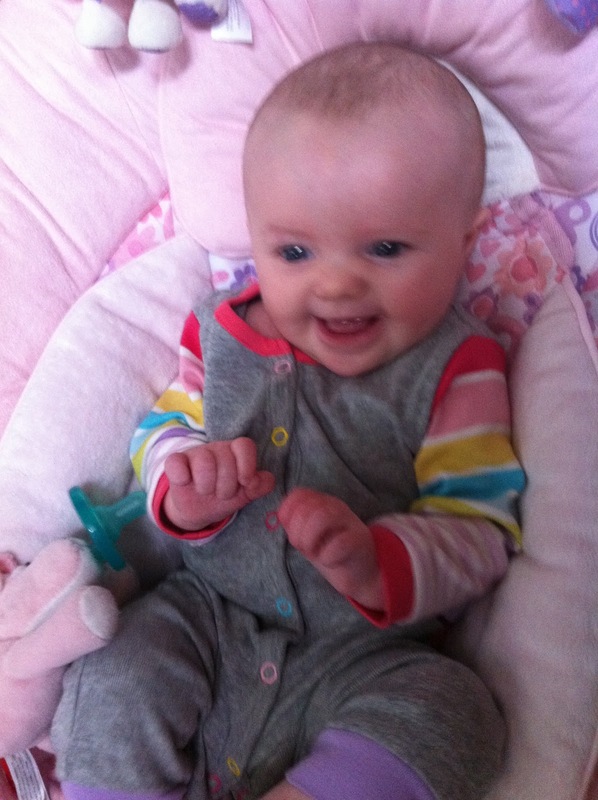 I can't wait to meet Diva McScreamyPants in person…she's got to be the cutest little girl I've ever seen….mean it. Precious Ella!!!! What a wonderful 4 months you have had!!!! !